If you're hoping to see giant Christmas light displays during your visit to Texas, you're in luck. There are several holiday light festivals and illuminated trails that dot the Lone Star State during the month of December. These extravaganzas of light provide opportunities to take in how different towns express their holiday cheer. No matter which Texas town you mosey into, you'll enjoy the ways locals decorate their trees and houses with animations and decorative, colorful lights. Even better, each town puts on special holiday celebrations. In Cleburne, a snug suburb south of Fort Worth, the Whistle Stop Christmas Lights show has been dazzling visitors for over 20 years. The main draw is the charming Market Square in downtown, which gets decorated corner-to-corner with twinkling lights, nativity scenes, and other seasonal displays. It all starts with a Lighted Christmas Parade in Downtown Cleburne on December 7, 2018. Once the parade reaches the Market Square, there are food and gift vendors, visits with Santa Claus and, of course, strolling through the lighted displays. Whistle Stop Christmas also offers many opportunities to take in musical performances from choirs to orchestral concerts. Theater fans can attend performances of both "A Christmas Carol" and "A Charlie Brown Christmas" for much of the month. The Texas Hill Country communities include 10 towns that informally create a Hill Country Lighting Trail. Each of these towns offers visitors shimmering, electric displays among the picturesque rolling landscape that stretches from San Antonio to Austin. San Antonio has it's unique River Walk Lights. As you travel through the Hill Country towns, a few of the must-see communities are Burnet, which becomes a recreation of Biblical Bethlehem right down to live animals and traditional bread making, Fredericksburg where they display their German heritage proudly with a European-themed Marktplatz and an ornate 28-foot tall wooden Christmas Pyramid filled with delightful figurines, and the Marble Falls Walkway of Lights, which features more than two million individual light bulbs. Drive along from town to town and you will see that the downtowns and neighborhoods offer dazzling light displays. On weekends, you're likely to find holiday-themed events, carriage rides, and music. Located on the northern border of Texas with Arkansas, Texarkana holds a Christmas parade early in December. In 2018 the parade will be held on December 3 at 7 p.m. Throughout the month, the historic downtown holds a holiday window decorating contest. Themes celebrate the winter wonderland season. One of the most famous Texas light trails, Jefferson’s Holiday Trail of Lights, features an enchanted forest, a life-size gingerbread house, a candlelight tour of homes, and plenty of lights. Thousands head to Jefferson, located northwest of Shreveport, Louisiana, each year to view the Holiday Trail of Lights. Most of these visitors choose to make a weekend out of the trip and stay at one of Jefferson's many great bed and breakfasts and shop at the numerous quaint shops. Parts of the greater Holiday Trail of Lights are in Jefferson, Marshall, and Kilgore in Texas and in Natchitoches and Shreveport-Bossier City on the Louisiana side of the border. It's a cowboy Christmas in Richmond near Houston, where the George Ranch Historical Park features an old-fashioned roast chicken dinner with all the fixings. As a part of Campfire Christmas, visitors can take a ride through the park on a classic hay wagon, take a look at the Christmas-decorated Jones Stock Farm, and listen to stories told by candlelight. The park also provides events throughout the entire month of December, like Christmas in the Park, Children's Campfire Christmas, and the New Year's Eve Historical Bash. It's always magical to walk along the River Walk in the evening. 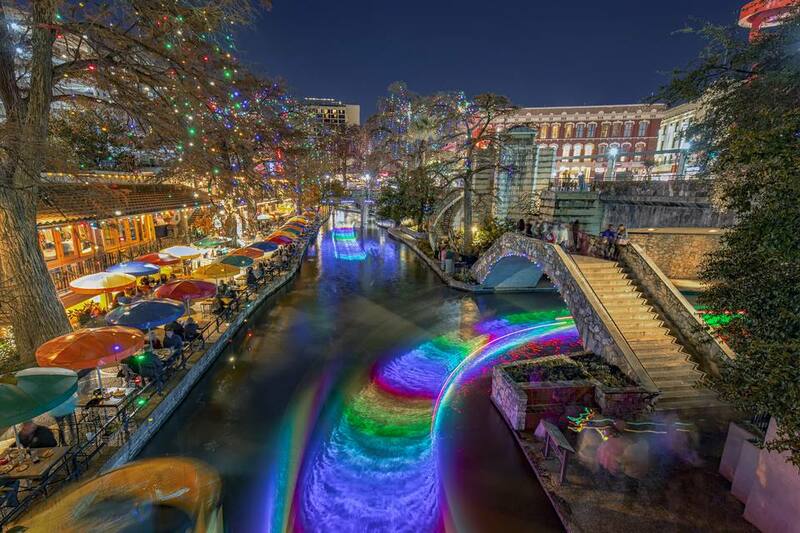 But on the Friday following Thanksgiving, a switch is thrown and over 122,000 twinkling lights form a colorful lighted canopy over the ​San Antonio River Walk. A one-hour river parade kicks off the season and through December lighted boats ply the waters, some with musical entertainment and others with diners enjoying full meals aboard. There is always something happening at the River Walk during the holiday season.